I have always had a soft spot for European Latin bands. Probably because, being a Latin myself, it’s been much easier to relate to their music and message. I guess that’s the reason I like 90% of the Italian metal bands and that’s why I enjoy so much the French groups Heavenly and Emoceans. It’s my true belief that they balance the teutonic German influence and the northern influence in the European metal scene. Having had in the past good or very good experiences with Spanish bands like Heroes Del Silencio, Dark Moor and recently Dreamaker or Lorien, I jumped at the opportunity of reviewing a new Spanish band. 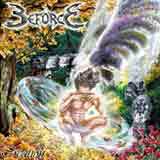 The style of newcomers Beforce is a straightforward speed metal, kinda like early Blind Guardian (without the boombastic or epic elements), with fast tracks (sometimes unnecessary fast), good guitar double riffs, excellent rapid solos and double bass drums. Unfortunately, what starts like a pretty convincing albums, turns after 50 minutes into a bitter dissapointment. And here’s the main reason: no matter how good the instrumental part is, you have to have at least an average lead singer to match and add to your overall sound and album conception. Although on the slower and quiet parts and using his mid range notes the singer (Dani Perez) has a nice tremolo (reminding me at times of David Taylor, ex-Jacob’s Dream), he stubbornly hits the high notes and just stays on that plateau though he doesn’t have the pipes or range for it. Most of the time he’s so out of range and out of the song’s flow that it compeletly ruins them. I have spun this album six times and I’m still nowhere near understanding why on Earth did he choose that style, because he doesn’t stand a chance at becoming the next King Diamond or John Cyriis. Unfortunately the music is pretty vocal-oriented (or it just seems to me that way), which makes the instruments (especially the guitars played by Dann Hoyos and Ignacio Portilla) to fall back in the mix, affecting the presence of the lead guitarist - Dann (the true star of the band), his excellent solos and loops being overshadowed. The album opens with the title track short intro that throws us in the good opener Riding ‘Neath The Rain, this being the best song of the album (apparently there’s a video for it). Good speed and heavy guitars, with distorted vocals at first then with an ok backing vocals. A good build up that leads to an excellent guitar solo, with bridges somewhat similar to Therion’s 1997 Into Remembrance main guitar riff, played in full force, sharp and crystal clear. Outsider For the Nature has the best balance between the vocals and the guitars, again with a clean and crisp full speed solo. From now on the album becomes a constant battle between bad vocals and good-to-excellent guitars, each of them trying to take centerstage. Beauty In Darkness is a so-so power ballad, unfortunately the chorus is disturbingly similar to Fates Warning’s 1984 Night On Brocken title song. Thank You Mountains should have been the tent pole of the album (clocking at almost 10 minutes), sadly it’s just the same standard 100mph song with a 3min hiatus in the middle with some Spanish lines, that is completely out of place. On Genesis we have again bad vocals with even worse backing vocals over a good drum rhythm and double guitar riffs. The final track Wake Up starts pretty slow with a good acoustic guitar intro which builds into a double guitar rhythm. We even get some growl parts that lack any aggression or power. The other songs of the album, Wrong Way, Reaching The Shore (pointless 60sec. instrumental) and Void (actually appropriate titles!) are just fillers with hardly something worth mentioning aside from the lead solos. Despite all the flaws, I think that there’s some potential here. If the band members focus the compositions around the lead guitarist, with the ok rhythm section, a better production (giving everyone an equal shot at being heard, by the way, is there a bass on the album?) and even with the sub-par vocalist (on the condition that he uses the limited resources that he has on behalf of the band rather than himself), there is a chance we could be presented in the future with a much better side of this band. If you are a diehard fan of lightning speed riffs, good clean guitars and if you are able to ignore weak production and bad vocals, you can take a shot at Beforce. Other than that, by all means, stay away!